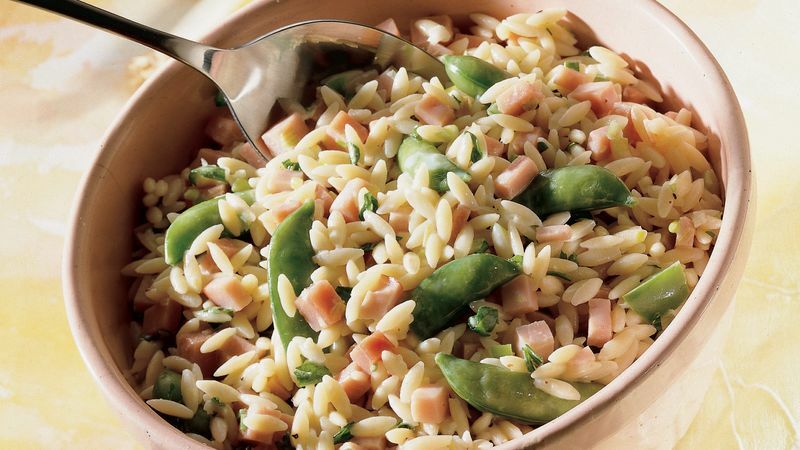 In Dutch oven or large saucepan, cook orzo in lightly salted boiling water for 6 to 8 minutes or just until tender. Drain; cover to keep warm. In same Dutch oven, melt butter over medium-high heat. Add onions, bell pepper and bacon; cook and stir 1 to 2 minutes or until onions are tender. Reduce heat to medium. Add sugar snap peas; cook 2 minutes. Reduce heat to low. Stir in lemon-pepper seasoning, salt and half-and-half. Simmer 2 minutes or until warm. Stir in cheese, parsley and cooked orzo.